E. H. Shepard is inevitably best known for, and defined by, his iconic illustrations for the children’s books The Wind in the Willows and Winnie-the-Pooh, but he had many more artistic strings to his bow, as cartoonist, magazine and periodical illustrator, drawer of book jackets and covers, and author. Born in London in 1879, he hailed from an artistic and literary family and was brought up in London, showing artistic promise from an early age. From the art class at St Paul’s School and Heatherlys, he progressed to the Royal Academy Schools, winning a series of scholarships and awards, and gradually built up a freelance career as artist and illustrator in the years before the First World War. Until now, it has always been thought that this portrait was purchased at the Summer Exhibition: Shepard makes no further reference to it, and it is not catalogued in his personal archive. From the context it would seem likely that this portrait of Ethel Shepard was exhibited at the Royal Academy in 1902, the same year that the Newport Museum and Art Gallery's 'Portrait of a Young Woman' was acquired. Ethel Shepard was of a similar age to the woman pictured in this portrait, and so might this be the ‘missing’ portrait of Ethel? Further enquiries may perhaps throw more light on this intriguing mystery. In 1904 Shepard married a fellow artist, Florence Chaplin, and they established themselves in a cottage in Shamley Green, near Guildford, convenient for London. Here Shepard laid the foundations of his future career, gradually building a reputation as a reliable and creative artist and illustrator, and it was from here that his first submission to Punch magazine was accepted. He also developed a line in book illustrations, something that would stand his future career in good stead. He had two children, Graham and Mary, and lived a modest but contented life, focused on his family. However, as for the vast majority of the population, all this was to change dramatically as conflict in Europe turned into what became known as the First World War. 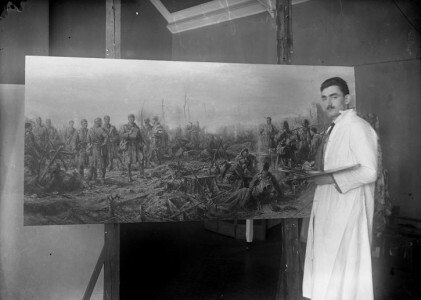 Shepard’s War (published by Michael O’Mara), with an accompanying exhibition, throws light on this unexpected aspect of Shepard’s life and career: his active military service in the First World War. 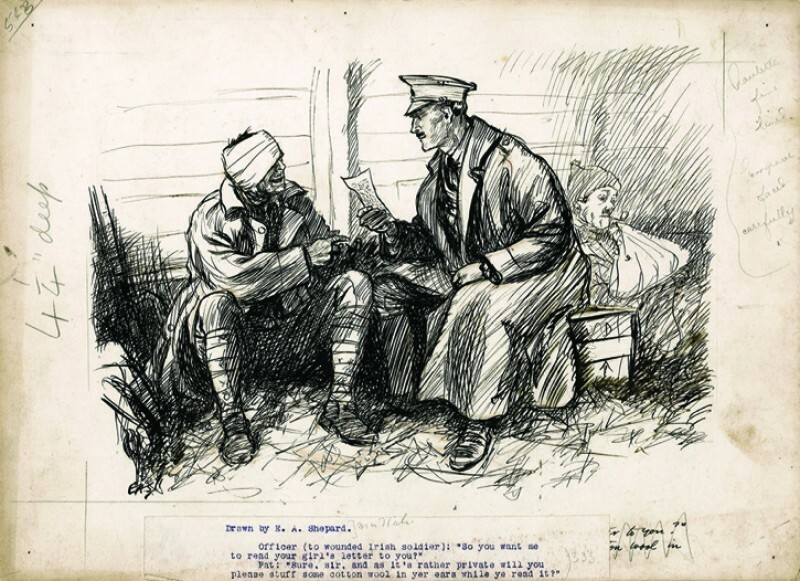 Whilst frustrated at not being able to enlist immediately (only single men under 30 could enlist at that stage), he began representing war images in his drawings and cartoons, particularly for magazines like Punch, the Illustrated London News and London Opinion. These often showed a lighter side to the war, showing civilians getting confused, the army getting muddled and the Germans getting out of their depth. In 1915, Shepard, with his great friend Bruce Ingram, editor of the Illustrated London News, was able to enlist and started training, and early in 1916 Shepard was posted to France as a junior officer in a field artillery battery. He served at the front through the battles of the Somme, Arras, Ypres and Passchendaele; his elder brother was killed on the first day of the Somme and Shepard endured many horrors, privations and hardships on the Western Front. For his own ‘conspicuous gallantry’ at Arras he was awarded the Military Cross. In 1917 he was transferred with his unit to Italy, where again he served with distinction throughout the Italian campaign of 1918, and remained with his unit dealing with the aftermath of the war until the spring of 1919, when he was demobilised. As far as we understand, when Shepard returned home to his family and resumed his career, he packed away everything connected to his war service, and there it has lain, undisturbed, for the best part of a hundred years. 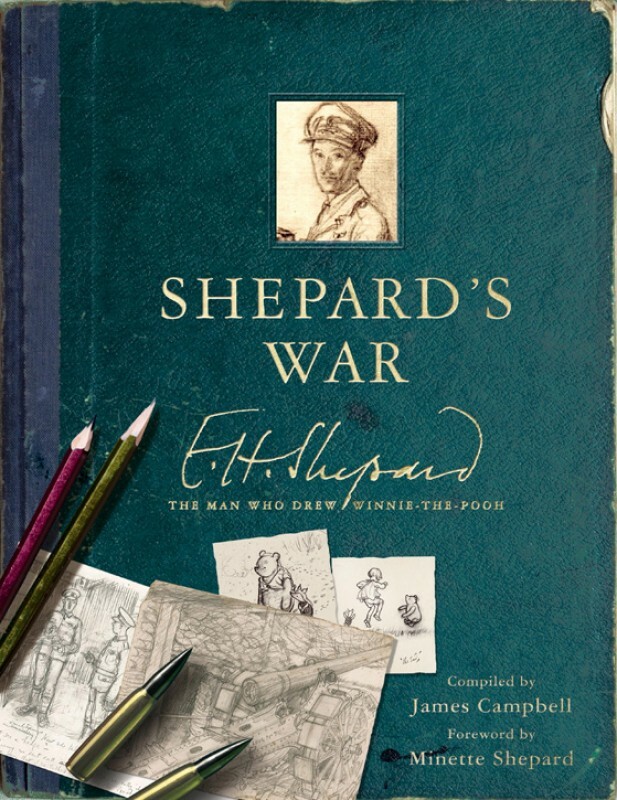 The book and exhibition opened the door on a wide range of works by Shepard – drawings, illustrations, maps, diagrams, photographs and more – and include amusing cartoons and recorded incidents, which tell both Shepard’s personal story of his war experiences as well as demonstrating the poignancy and pathos of the impacts of conflict on both military and civilian populations. The book also chronicles Shepard’s meetings with the Prince of Wales and Ernest Hemingway, his continued work for publications back at home, and his efforts for the Intelligence Corps. 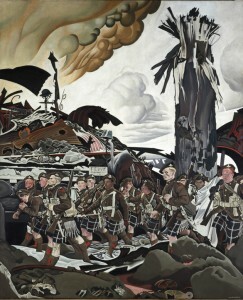 Most of the material has either not been seen since the First World War, or has never been published: it forms a unique and individual story of an artist’s war. After the war, Shepard resumed his career with alacrity, and soon became an established member of the Punch team, with a seat at the famous ‘Punch table’, and it was here, in 1923, that E. V. Lucas, a Punch colleague and also the Chairman of the publisher Methuen, turned to Shepard and asked if he would illustrate some charming verses by A. 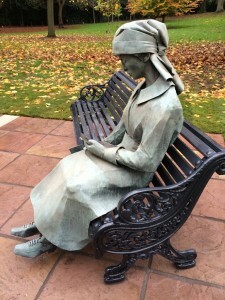 A. Milne – and the rest is history. The charming verses became When We Were Very Young, and were followed by Winnie-the-Pooh, Now We Are Six and The House at Pooh Corner, which were an immediate sensation and publishing success, with Shepard’s illustrations a key and integral part of the books’ appeal. A. A. Milne then introduced Shepard to Kenneth Grahame, who had written The Wind in the Willows some thirty years previously, but had been unable to find an illustrator able to bring his magical creations to life. Shepard went to see Grahame, and wandered along the banks of the Thames at Pangbourne, near Grahame’s home. Inspired by the landscape he produced the wonderful drawings which pleased even Grahame, and which have never been out of print. Shepard worked as chief cartoonist at Punch from the 1930s, producing weekly cartoons of current events, including the Abdication crisis, Appeasement, the Munich ‘Peace in our time’ agreement, the outbreak of war, the downfall of Neville Chamberlain and the rise of Winston Churchill, and the new world of the Labour government after the war had ended. He continued to produce other work, illustrations and drawings, and new versions of the Winnie-the-Pooh and The Wind in the Willows characters. Towards the end of his life, he wrote two volumes of charming personal reminiscences, Drawn from Memory and Drawn from Life, and two children’s books, Ben & Brock and Betsy & Joe, both illustrated in his inimitable style. Shepard lived a long and fulfilled life ­– his first drawings date from the 1880s, and he was still drawing and illustrating at the end of his life in the 1970s – ten decades of active artistic endeavour. He died peacefully at his home in Midhurst in West Sussex in 1976, at the age of 96. Editor's note: The exhibition 'E. 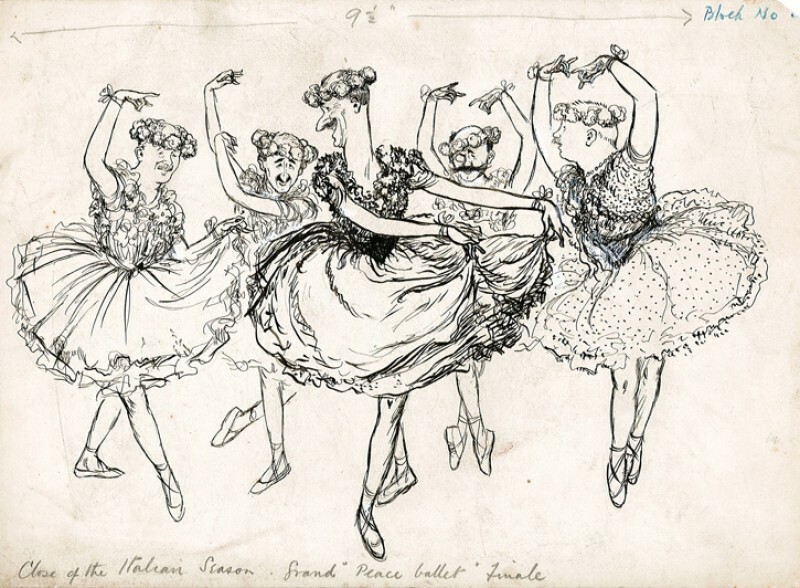 H. Shepard: An Illustrator’s War' ran at House of Illustration from 9th October 2015 to 10th January 2016. Shepard’s War is compiled by James Campbell and published by LOM Art, an imprint of Michael O’Mara Books.